Major state parks and lakes, quaint villages, beautiful scenery, and a growing number of Amish & Mennonite communities make Highland, Ross and Pike counties Ohio a great day-trip destination. I have resided in close proximity with Mennonites and Amish for the better part of two decades. Also, in the 1960s, while serving in the US Navy, I was stationed close to Southeast Pennsylvania’s Lancaster County, the home of the Pennsylvania Dutch. What I have learned over the years is that there is no single definition that applies to them. While there is a common core, such as their belief in Anabaptism, their beliefs and lifestyles can vary greatly between different communities. Each group or community is free to establish for itself how they will live together. For example, while the conservative Amish who live closest to me shun electricity, modern agricultural equipment, tractors, and automobiles, they do permit the owning and operation of a tracked vehicle having the ability to push or lift but not to pull. My Mennonite neighbors, who are slightly more liberal, don’t accept such equipment. My daughter’s family owns an organic dairy which is operated by a local Amish man. This individual does not own the cows so it is acceptable that he use electric milking machines. If he owned the cows his elders would require he milk by hand. In the Southern part of Highland County there resides a group of conservative or “old order” Amish and their mode of dress is different from those who live in the Northern part. The men wear differently woven straw hats and there is a distinct difference in the bonnets worn by the women. Typical Amish buggy of our area with steel tires, no windshield, and roll up door flaps. This configuration may be entirely different with another community. While traveling the roads of our area it is quite common to come upon a horse-drawn buggy. One can identify whether it is Amish or Mennonite by several means. 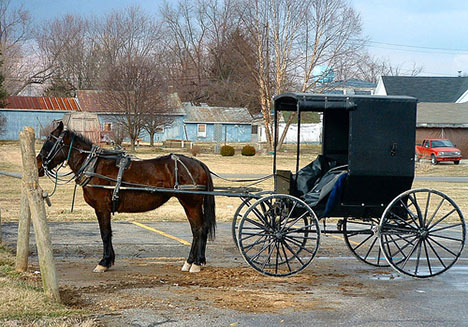 If it has solid rubber tires on the wheels, a windshield, and a sliding side door, it’s Mennonite. Amish buggies have steel tires, no windshield, and cloth roll up doors. All that I’ve described only applies to those groups who live near me. Go into Fayette or Clinton counties and the rules may change completely. Matter of fact, we also have some far more liberal Mennonites in Highland County. They still hold true to the basic religious tenets but have adopted many modern aspects of life. They drive cars, farm with the latest powered equipment, have electricity in their homes, wear more colorful attire, etc. I have provided Wikipedia links to both groups but there is an infinite amount of information about the “plain people” to be found with a simple Google search. Another informed source can be found at Amish 101.